The Continuing Committee is proud to announce the imminent release of Infinite Diversity, a unique Second Edition virtual expansion designed to enhance the game in more ways than any previous virtual expansions. Infinite Diversity will be available for free download from The Continuing Committee's website (http://www.trekcc.org) on Friday, April 23, 2010. Infinite Diversity contains nineteen (19) new virtual Second Edition cards as well as one (1) reprint, and will change the game more than any previous expansion. In fact, Infinite Diversity has been designed with three very specific goals in mind. The biggest goal the design team had in mind when creating Infinite Diversity was the creation of a virtual draft kit. With a few copies of this virtual expansion and some booster packs, players will be able to participate in their own draft tournaments! But wait, there's more! Infinite Diversity is specifically designed to enable a virtual draft format, so you can host draft tournaments even in areas without access to physical booster packs! The second goal behind the design of Infinite Diversity is to fill in some of the gaps identified in the Virtual Tournament Format. While the heart and soul of the game will always be in Standard Constructed, the Virtual Format offers some unique experiences and is especially suited to new players. In the Virtual Format, only printable cards are legal for deck construction. While you can substitute a physical card for a printed copy, the decks can only contain cards that could be printed: virtual cards, printable proxies, and cards in the errata file. Did you know that there are several cards in Virtual Format that reference or rely on a Damage event, but there are no printable Damage cards? 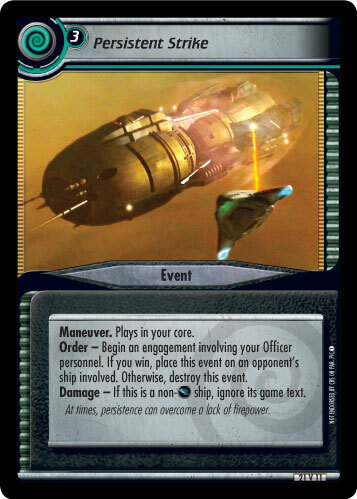 Infinite Diversity brings a new Maneuver event, Persistent Strike, to the game... and it just so happens that it features Damage marker text. Now you can threaten all of your opponents with the might of a Rogue Borg Ship! 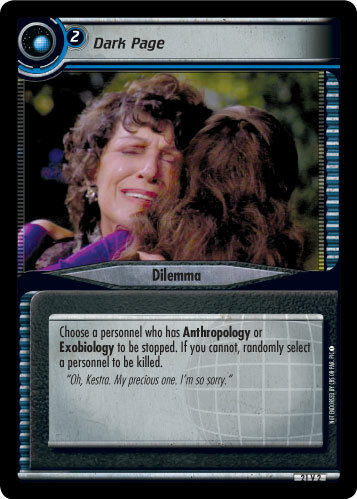 The dilemmas in Infinite Diversity will also plug some of the holes that were identified in the Virtual Format experience. Each of the eight (8) new dilemmas has a very specific purpose and will diversify and enhance virtual dilemma piles all across the globe. One of my favorites is Dark Page, a new "do or die" dilemma that will ensure that you can stop that one extra personnel in your opponent's mission team. Last but not least, Infinite Diversity will bring some new tricks and opportunities to the Standard game and affect constructed decks as players do battle for one of the coveted Regional Championships. New equipment, events and even a huge new mission will all give you some new tools for your decks, or some new weapons to bring more trouble to your opponent. Have you ever wanted a back-up ship but puzzled over which one to include? How about the Olarra? 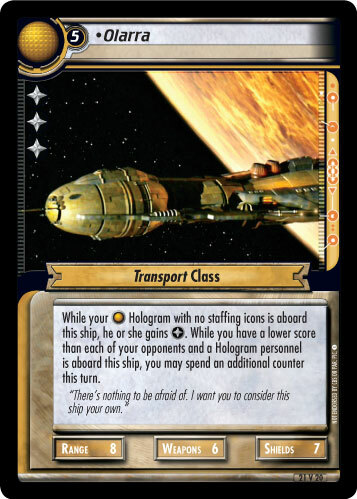 It's a Range 8 ship, it has reasonable cost and staffing requirements, and if you manage to fall behind, it will help you catch up to your opponent. Of course, you have to have a Hologram aboard... but once Infinite Diversity is released, I don't think that will be a problem for most of you! Infinite Diversity will also give players several new weapons to pack against those pesky micro-teaming decks that seem to be all the rage these days. But, you'll have to wait for another day to take a look at those cards! All in all, Infinite Diversity promises to bring a lot of new tricks to your decks, and a lot more troubles to use on your opponents. The new Virtual Draft format is going to be a lot of fun and will really help get new and returning players into the game. Virtual Format tournaments all across the globe will become more diverse, and players will be inspired to build new decks and empowered to resist the decks that are dominant in today's meta-game. To celebrate the release of Infinite Diversity, our Shipping Department has put together a spectacular release kit featuring an amazing alternate image version of the Olarra. You can request a kit to be sent to your house via The Promenade. Request your kit early to ensure that you can get one in time for your release event! Stay tuned over the next two weeks for daily spoilers, articles about draft strategy and the new draft rules, card extras, and more! If you have questions about Infinite Diversity, visit our Boldly Going forum to ask them and you'll get answers from other members of the community - or even the design team for this expansion! Infinite Diversity will be available, free of charge, on Friday, April 23, 2010. As always, the cards within will become legal in Continuing Committee sanctioned play one week later.